In the past, if you needed a tooth filling, the filling was composed of an amalgam of different metals. This would result in a very strong and durable, but very unnatural-looking filling. However, with new technology, we’re able to provide tooth fillings that are free of metal and look almost completely natural. Here at Santa Monica Family Dentistry. we use special materials, such as porcelain and composite resins that more closely resemble the materials in your teeth, we’re able to make durable, natural-looking fillings that are completely safe and blend almost perfectly with the rest of your tooth. And not only do they look like normal teeth, but they act and react like your normal teeth as well. What Makes Composite Fillings Different? The outside of your tooth is made up of enamel, a hard, strong substance made up of calcium crystals bound tightly together. However, enamel is not made of living tissue. This means that porcelains used in dentistry can easily mimic the enamel of your teeth, both in appearance and in function. 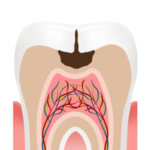 The inside of your tooth, meanwhile, is softer and more porous, and filled with deposits of calcium. This material is known as dentin, and it is both sensitive and alive. 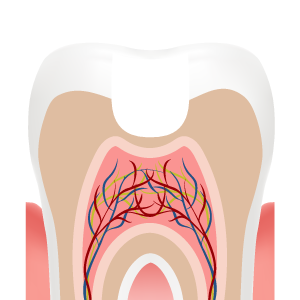 This allows your teeth to feel heat and cold and other sensations, sending impulses through the pulp and into the nerve. Traditional metal fillings could not imitate this behavior, but composite resins used in modern fillings can, because they are made of a material very similar to dentin. Further Advantages of Composite Fillings. Metal fillings also were unable to bond with the tooth. Instead, they simply rested in the cavity. However, with porcelain and composite resin tooth-fillings, we are able to bond them to the rest of the tooth, resulting in a much stronger and much more comfortable filling. Because modern fillings can bond with the tooth, your filling will not only look natural but will also act like it was always a normal part of your tooth.